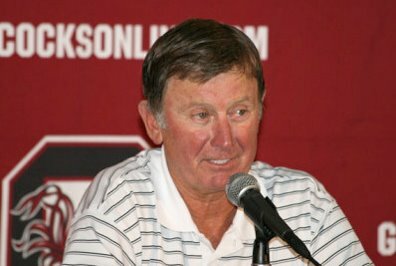 Steve Spurrier runs a tight ship….unless you perform on the field. News broke yesterday that South Carolina quarterback Stephen Garcia was dismissed from the team. The “Old Ball Coach” really put his foot down and sent a clear message to his players–if you are going to have off the-field-problems, your statistics had better be there…otherwise, you’re gone. Garcia had more than his share of off-the-field. Although the NCAA doesn’t keep the stat on their main board, Garcia’s unprecedented five suspensions has to be some kind of record. Despite those suspensions, including his last documented on last spring indefinitely for causing a disturbance in a mandatory SEC players meeting which, ironically enough, centered around life choices for student athletes. Even after that suspension, Garcia was promptly reinstated by Spurrier–just in the time for the opening of the 2011 season. The troubled quarterback undoubtedly received a fair amount of lieniency, largely due to his productive season on the field last season. In that sesason, Garcia threw for over 3,000 yards, completed 64% of his passes and had 20 touchdowns against 14 interceptions and led the Gamecocks to a SEC Championship Game–the first appearance ever by South Carolina. Fast forward to this season, where Garcia has struggled mightily, throwing only four TDs and 9 interceptions with an unattractive completion percentage of 51%. Couple that with sophomore backup QB Connor Shaw’s stellar performance last weekend against Kentucky, where he threw for over 300 yards with 4 TDs and no picks, and all of the sudden, Garcia’s off-the-field antics were viewed as much more detrimental to the team. Spurrier taught his troubled quarterback a valuable life lesson this week. Win football games and put up good stats, and you’re untouchable. Should you lose a step on the field, however, and Spurrier will run his program with an iron fist. You have to love a coach who prepares his young men for the harsh realities of the world–well done, coach. Week 6 of the college football season is in the books, and once again, College FootBlog brings you a complete recap of the week that was. Check out our breakdown of five key bits of info you can’t do without as we continue through the 2011 college football season. No Florida Schools in the Top 25: Florida State was supposed to be the bell cow of the ACC and the state of Florida in 2011, but after suffering their third straight loss to Wake Forest last weekend, the ‘Noles are out of the top 25. Much hype was surrounding the Florida Gators, but back to back games against Alabama and LSU would be enough to drop anyone. The Gators were hammered 41-11 by LSU, and the second-straight loss was too much to keep them in the rankings as well. Miami, USF and UCF have all been mentioned in the top 25 at different points this season, but all have lost critical games this season, and all are on the outside of the polls looking in. Red River Blowout: Many (including myself) thought Texas was way overrated coming into this game–the Longhorns were ranked as the #11 team in the nation, but very few predicted the kind of beat down the Sooners would deliver last weekend. The OU defense outscored Texas in this one, accounting for three touchdowns. 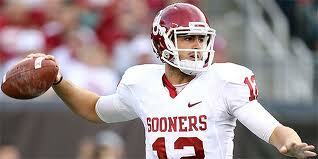 The fast-paced OU offense did their damage as well, on their way to a 55-17 blowout victory for Oklahoma. Michigan off to the quietest 6-0 start in history: The dominance of Wisconsin and the implosion of Ohio State have been the main topics of discussion this season in the Big Ten. That has overshadowed a fantastic start by first year head coach Brady Hoke’s perfect start in 2011. Hoke has done a lot with very little, especially on the defensive side of the ball, but the Wolverines aren’t getting much love. A win at rival Michigan State this weekend would not only make the Wolverines bowl eligible in mid-October, it would also serve as notice to the college football world that, while Michigan is still not a top 10 team, Hoke has cleaned up Rich Rod’s mess much faster than anyone could have imagined. Mark Richt gets 100th win: After starting the 2011 season with a loss against Boise State and a heart-breaker at home to South Carolina in week 2, the Bulldogs won their third straight game last weekend at Tennessee. 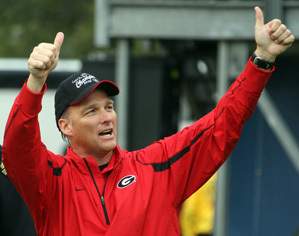 The win was head coach Mark Richt’s 100th as a head coach in Athens. Richt, who came into this season on the hot seat, has Georgia playing better than any team in the SEC East. A win against rival Florida on October 29th could buy him an extra year and vault the Dawgs into an SEC Championship Game. In a stunning revelation, Ohio State is the “poster child” of compliance: I was under the impression that massive suspensions of key players, the untimely departure of a hall of fame coach amid controversy, inappropriate dealings with boosters and free tattoos and gifts from a known Columbus drug dealer were signs that an athletic program wasn’t keeping very good tabs on its student-athletes. Fortunately, for people like me, who were completely misunderstanding the situation at OSU, their president Gordon Gee took the liberty of clearing up that slight misconception. Gee informed the Ohio State faculty last week that OSU is the “poster child” of compliance. In the wake of that announcement, Charlie Sheen is expected to announce that he is the poster child of child care, Lindsay Lohan is expected to announce that she is the poster child of sobriety, and Carrot Top is expected to claim he is the poster child of comedy. Week 5 of college football is officially in the books, and we had several bigtime match ups, the results of which have given us a clearer picture of who is legit and who isn’t. College FootBlog breaks down last weekend’s action in our weekly recap. Russell Wilson has officially thrown his hat into the Heisman race: The knock on the Badgers going into last weekend’s bigtime match up against Nebraska was that they hadn’t played anyone of substance yet. No one, however, argued the fact that Wilson had been lights out–he entered the weekend with 11 TDs and only one pick. Although he may not rip off as many highlight reel plays as Denard Robinson or Robert Griffin III, consistency is the name of the game, and Wilson has been consistent ever since he started his college football career at NC State. Wilson made critical play after critical play on Saturday night and led the Badgers to a convincing 48-17 victory to open conference play. On the year, he is completing just under 75% of his passes for 13 TDs and just one interception. He has also added two rushing TDs as well. The forced transfer from NC State head coach Tom O’Brien may have been the best thing for Wilson, who now has a shot at a BCS title and a Heisman…neither of which would have been on the table had he stayed in Raleigh. Bama imposes their will: The highly anticipated clash between Nick Saban’s defense and Charlie Weis’ offense turned out to be all hype with zero substance. The Crimson Tide held Florida’s speedy backfield tandem of Jeff Demps and Chris Rainey to a measly 8 yards rushing on their way to a 38-10 rout in the Swamp. The Bama defense is holding opponents to less than 40 yards rushing per game, which is the tops in the FBS. They also rank first in scoring defense, they are #3 in total defense and #5 in passing defense. Clemson passes another big test: Although the Tajh Boyd and Sammy Watkins connection was held in check for the first time this season, it was the Clemson defense that took care of business as the Tigers passed their first road test at Virginia Tech 23-3. And here is a name for all the folks that are already taking a peak at the 2012 NFL Draft–Dwayne Allen. The junior is the best TE in the nation and has presented match up problems for every defense the Tigers have faced. He currently has 291 receiving yards and four touchdowns. Dabo Swinney’s team has now beaten three ranked teams in three consecutive weeks. Andrew Luck lights up UCLA: The most NFL-ready quarterback from last year’s class shocked everyone when he announced that he would play his senior season at Stanford. While other college football players may have more flash, Luck has led the Cardinal to one of the most quiet 4-0 starts in recent memory. The signal caller shredded the Bruin defense last weekend, going 23-27 for 227 yards and three touchdowns. A bye week in week 4 and a pretty weak schedule has kept Luck’s stats under the radar, but when the dust settles, he will be one of the last men standing in the Heisman race. Ohio State hasn’t earned any free tattoos this year: The Buckeyes were expected to struggle a bit through the first few games because of the suspensions from last year, but very few people would have thought they would be 3-2. The quarterback play simply hasn’t been there for OSU, and it is about to get much worse. The meat of Big Ten schedule has now arrived, with the Buckeyes traveling to Nebraska, a surprising Illinois team and playing host to Big Ten favorite Wisconsin. If things don’t change fast, OSU could easily be 3-5 going into November. Those kinds of results wouldn’t even cover a basic body piercing. Week 4 of the College Football season is officially in the books, and the dominant players and teams are beginning to separate from the rest of the pack. College FootBlog breaks down last weekends action in the Week 4 Recap. Sooners fall out of #1 spot: Once a Heisman front-runner, Oklahoma quarterback Landry Jones has been very average the last two weeks, throwing for 4 TD’s and 4 picks. The Sooners still won, but they didn’t exactly get the payback they were looking for against Mizzou, who upset OU last season in Columbia. Wins against Florida State and Mizzou, who are both 2-2 with no big wins against major programs, along with LSU’s dominance against top-tier competition allowed the Tigers to jump ahead of the Sooners in the AP Poll. Luckily for Sooner fans, LSU and Alabama square off in Tuscaloosa in a month, so one of those teams will drop a few spots. LSU’s Tyrann Mathieu may be the best DB in the country: LSU and Alabama have the two best defenses in the country–and it’s not even close. The Tigers have forced 12 turnovers against top-flight competition, all away from Death Valley. Their defense is full of elite talent that will be playing on Sundays in the near future, but the guy that always seems to make the biggest plays on the biggest stages is cornerback Tyrann Mathieu. In last weekend’s bigtime match up against West Virginia, the sophomore DB had a key interception and a forced fumble, in which he literally ripped the ball right out of the hands of WV wideout Brad Starks. That makes twice that Mathieu has brought his A-game to a national television audience–in week one, he stripped the ball from Oregon punt returner Kenjon Barner and promptly took the fumble in for a touchdown, and the Ducks never recovered. Oklahoma State’s Brandon Weeden continues to light it up: We anticipated a shoot out, and that’s exactly what we got last weekend, when Oklahoma State traveled to Texas A&M. Weeden threw for 438 yards (a new school record) and two TDs against the Aggies. The senior quarterback completed a whopping 47 passes in 60 attempts and spread the ball around nicely–he had three different receivers with ten or more catches, led by dynamic wideout Justin Blackmon, who had 11 catches for 121 yards and a touchdown. 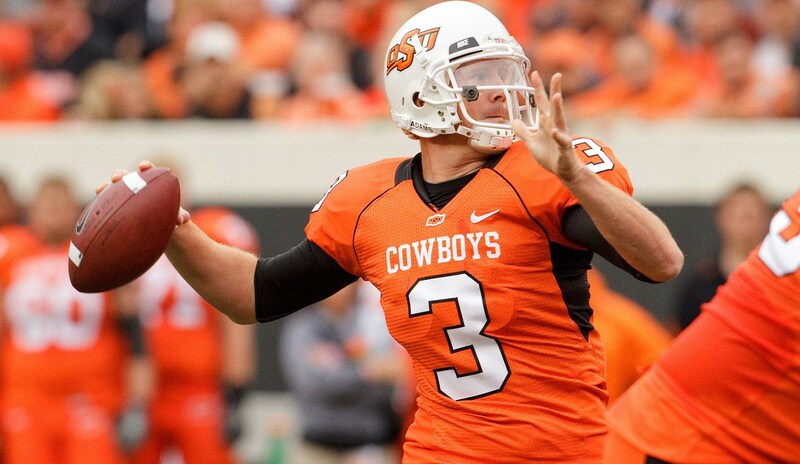 Weeden currently leads the nation in passing yards per game with 398.0 per contest. Florida could be back: After a disappointing 2010 season, first year head coach Will Muschamp has the Gators off to a 4-0 start, 2-0 in SEC play. Quarterback John Brantley looks much more comfortable in Charlie Weis’ pro-style attack versus Urban Meyer’s spread attack that made Tim Tebow a household name, although they didn’t need much passing last weekend against Kentucky, as both Jeff Demps and Chris Rainey rushed for over 100 yards a piece. More importantly, Muschamp has brought his attitude to the Gator defense, who created four turnovers last weekend. We’ll see just how far Florida has come very soon–the Gators host Alabama this weekend and travel to LSU next weekend. The ACC is not good at tackle football: I’m not sure how the intramural flag football programs in the ACC are, but several programs proved their conference still isn’t ready for big boy football. After giving then #1 Oklahoma all they could handle, Florida State’s defense was gashed by the Clemson QB-WR combo of Tajh Boyd and Sammy Watkins. The ‘Noles gave up 455 yards to the Tigers, 366 coming through the air. FSU was supposed to be the ACC’s hope for a title-contender in 2011, but that’s not going to happen. Miami lost to Kansas State, NC State was destroyed by Cincinnati, and Maryland had the ugly knocked out of their uniforms by Temple 38-7. Until the ACC can beat quality out of conference opponents, they will not be taken seriously in the BCS title talk. Another week in the books for the 2011 college football season, and as we continue to learn more about the contenders and pretenders, College FootBlog breaks down some of the action from Week 3. Oklahoma passes major test: One of our contributors, Christian Hon, and I actually covered this game and the pregame festivities (check out the on location podcast and tailgate and game footage), and what a fantastic football game! In the end, though, the Sooners showed why they’re the #1 team in the land. Although OU quarterback Landry Jones was held under 200 yards passing and picked off twice by Florida State, he completed a clutch touchdown pass in the fourth quarter when the game was tied. Oklahoma is known for their explosive offense, but it was their defense, led by linebackers Travis Lewis and Tom Wort that stepped up and passed what may have been the most difficult test of the regular season. Notre Dame finally gets a win: The Irish still have a tough road ahead of them if they want to finish above .500, but they managed to knock off the favored Michigan State Spartans in South Bend last weekend. Similar to Oklahoma, it was the defense that stole the show for Notre Dame, holding Michigan State to just 29 yards rushing. The defense was non-existent against Michigan in week 2, so Irish fans have to feel good about the 31-13 victory over their hated rivals from East Lansing. The next three weeks see the Irish traveling to very mediocre Pitt and Purdue, followed by a home game against Air Force. If they can win two of those games, Brian Kelly’s face may turn back to red, as opposed to the bright purple shade he sported in the South Florida game. Oklahoma State continues to win shoot outs: The Cowboys have given up an average of 27 points per game so far this season, which ranks 76th nationally. The good thing for Mike Gundy is that the OSU offense is averaging over 52 points per game, which ranks #3 nationally. The main reason for this offensive output is senior quarterback Brandon Weeden, who has thrown for 1154 yards in the first three games of the season. OSU will get their first real test of the season this weekend, when open up conference play at Texas A&M this weekend. With Oklahoma State’s non-existent defense, there won’t be a shortage of points this weekend at College Station. Kellen Moore keeping his name on the Heisman list: While Toledo may not garner a ton of national attention, they are a legitimate football team, one that gave Ohio State all they could handle in week 2. For Boise State quarterback Kellen Moore, it was just another day at the office. The senior QB threw for 455 yards and 5 TDs. On the season, he is completing 78.9% of his passes with 8 TDs and only 2 Ints, and that’s only in two games. Look for Moore to put up 4,000 yards and 35+ touchdowns and represent the Broncos in New York as a finalist for college football’s most prestigious award. Heart of Stanford’s defense, Shane Skov done for the season: While most of the hype of the Stanford Cardinal surrounds Heisman front-runner Andrew Luck (and rightfully so), the heart of the Cardinal defense is (and has been) Shane Skov. This is a huge loss to a team that many expect to challenge Oregon for the inaugural Pac 12 title. The junior linebacker was highly touted coming out of high school and has lived up to his billing, leading Stanford defensively in last year’s Orange Bowl with three sacks and leading the Cardinal in tackles so far this season. Luckily for Stanford, October 22nd is the first test against a decent offense, when they play host to the Washington Huskies. Three football games should give the defense a chance to gel as a unit before they get into the meat of their schedule. With the end of week 2, the 2011 college football season continues to take shape. <a href=”collegesportsfeed.com”>CSF</a> highlights five of the most crucial outcomes from the second week of the young college football season. 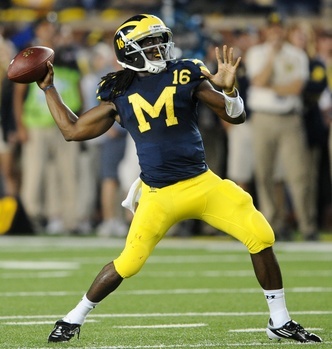 Denard Robinson is still lightning in a bottle: After having an up and down game through the first three quarters against Notre Dame, Michigan’s dynamic play maker saved his best for last in what was an instant classic in one of the most storied rivalries in college football. Robinson threw for two touchdowns in the final 1:02 of the game, capping off yet another performance that saw him rush for over 100 yards and throw for over 300 yards. Health is the key for Robinson, whose body wore down the second half of 2010, but he proved once again that he is arguably the most exciting player in all of college football. <strong><a href=”auburn.rivals.com”>Auburn</a> bounces back: </strong> After needing a recovery of an on-side kick to knock off visiting <a href=”utahstate.rivals.com”>Utah State</a> in week 1, the Tigers played host to <a href=”mississippi.rivals.com”>Mississippi State</a>. In another of the many thrillers of week 2. Auburn stopped Mississippi State quarterback <a href=”mississippistate.rivals.com”>Chris Relf</a> just in front of the goal line, which prevented overtime. The tough SEC schedule will only get tougher, but the Tigers passed a major test in week 2, against a legitimate top 25 team. Richt officially on the hot seat: Opening against two top 10 teams to start your season would be a tall order for any program, but that’s exactly what Mark Richt and Georgia has done in 2011. After taking on a gritty and underappreciated Boise State team (currently ranked #4 in both major polls), the Bulldogs had to play host to last year’s SEC East champs, South Carolina (currently ranked #10 in the AP poll). Bruising tailback Marcus Lattimore made up for quarterback Stephen Garcia’s dismal performance, by rushing for 176 yards and a touchdown. In yet another game that went down to the wire, Georgia fell 45-42, making them 0-2 to start the season. After going 6-7 last year, Richt can’t afford another losing season in 2011, and he has his work cut out for him to catch up after dropping the first two games of this young season. Russell Wilson continues to impress: After being shunned by NC State head coach Tom O’Brien for electing to play professional baseball this summer, Wisconsin gladly accepted the talented senior quarterback, and Wilson has delivered. In the first two games, Wilson has picked up right where he left off, when he led the NC State Wolfpack for his three years as their starter. Wilson is completing over 79% of his passes and has thrown for five touchdowns with no picks, and he has also added 73 yards and a touchdown rushing. Garrett Gilbert is out in Texas: In the 2009 BCS Championship Game, Gilbert, then a true freshman, relieved an injured Colt McCoy against the top defense in the country, Alabama, and he passed with flying colors. Although the Longhorns lost that game, Gilbert’s poise and athletic ability gave fans in Austin a lot to look forward to–at least they that’s what they thought. Last season, much of the blame for Texas’ offensive woes was blamed on Gilbert, who completed less than 60% of his passes with just 10 TDs to go along with 17 picks. In the first two games of the 2011 season, the junior signal-caller has done even worse, completing just 45% of his passes with two TDs and four picks. Head coach Mack Brown decided last week during the BYU game that enough was enough and replaced Gilbert with back ups Case McCoy and David Ash, who are expected to split time for the remainder of the season, while Gilbert watches from the sidelines. The first week of the 2011 college football season is officially in the books, and while the January bowls are still months away, we did manage to learn quite a bit from opening week. Here is College FootBlog’s Breakdown from Week 1. Another year, another over-hyped Notre Dame team: A lot of hype surrounded the hiring of former Cincinnati head coach Brian Kelly. Because of the dismal state that Charlie Weis left the program in, the expectations were not too high last season. This season was a different story. Most preseason polls had the Irish in the top 25, and last weekend’s loss to USF in South Bend was proof yet again that the Irish are not a dominant program. Much credit needs to go to USF and Skip Holtz, but once again, Notre Dame folded in the face of pressure and played like a team that was afraid of losing, instead of a confident team that expected to win. RG3 is good. 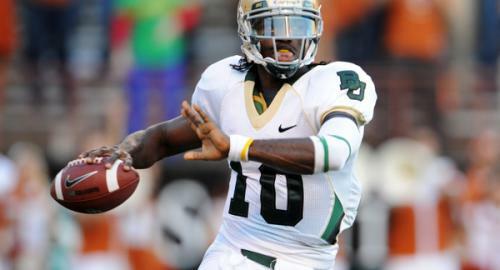 Very good: While most people who watched TCU fall to Baylor are discussing the fall of TCU from the nation’s elite, we prefer to look at the unbelievable play of Baylor QB Robert Griffin III. The junior signal-caller did everything except park the cars and sell the popcorn in Baylor’s amazing 50-48 victory over the Horned Frogs. Griffin III has somewhat flown under the radar because of other NFL prospects in the Big 12 like Blaine Gabbert, Josh Freeman and Landry Jones to name a few, but last weekend was not a fluke. RG3 came into the season with 41 career touchdown passes, versus only 11 picks. This will not be the first time you hear from Griffin or the Bears this season. Auburn could be in for a long season: The 2010 BCS National Champs had to recover an onside kick and score with less than a minute in their nail-biter against visiting Utah State last weekend. Much has been made of the Tigers’ holes vacated by Heisman Trophy winner Cam Newton and 13th overall NFL selection Nick Fairley, and the cynics got it right this time. Auburn could not slow down the Utah State, who racked up 227 yards rushing and 448 total net yards. With a healthy dose of SEC West opponents, it is only going to get more difficult, and the Tigers will have to fight to be bowl eligible this season. The SEC is still King. Just ask the Oregon Ducks: After Nick Fairley dominated the Oregon offensive line, this year was the Ducks’ opportunity to get respect for themselves and the newly expanded Pac 12, but LSU stood in the way of that, dominating Oregon in the first bigtime match up of the young season. Despite only getting 98 yards passing from Jarrett Lee, the Tigers stuffed last year’s leading rusher in all of college football, holing LaMichael James to an anemic 54 yards. Until Oregon can score against the SEC, they can rack up as many yards and points as they want–it just won’t get them back to a title game. Maryland trumps Oregon in most hideous uniform challenge: If you watched the Miami vs. Maryland game on Monday night, you may have thown up your hot wings. The Terps’ uniforms rivaled the uni’s from “Any Given Sunday”–if you’ve seen that horrible movie, you understand the comparison. Previously, Oregon’s all-fluorescent yellow uniforms took the cake, but Maryland trumped those on Monday. If nothing else, new head coach Randy Edsall has people (including us) talking and writing about Maryland football, which hadn’t been on the radar since Al Davis, in his infinite wisdom, took former Terp wideout Darirus Heyward-Bey with the Oakland Raiders’ first pick in the 2009 NFL Draft.